New Thursday, new SUMO Day! A new SUMO day is here! 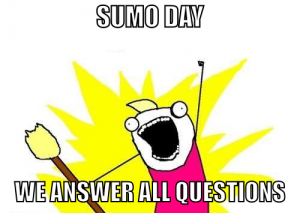 Every other Thursday we’re organizing a SUMO day where we try to answer all the questions coming on the support forum. This Thursday, February 28th is a new SUMO day! Join us, create an account and then take some time today to help with unanswered questions. Additional tips for getting started are on the etherpad. Our goal is to respond to every new question posted Thursday, so please try to answer as many questions as you can throughout the day. Last time, we managed to reach 92% of questions answered! Can we do 100% again?